The new standard by which 5m runabouts can be judged. Far from being just another 5m fibreglass runabout, Evolution’s 500 Sportsfisher manages to set a standard by which these boats can be judged. While the 5m hull looks pretty conventional on casual inspection, an in-depth perusal discovers lots of little exciting things. This is an exceptionally soft-riding hull. From the keel line to the first strake, this hull is concave, increasing the deadrise angle where the hull cuts rough water. There’s also a subtle downslope to the strakes to deflect water downwards. Evolution recommends no less than 75hp and with a 90hp Evinrude E-Tec, it planed effortlessly at a mere 6.1 knots and 1750rpm. The entire below-decks area of the all-GRP hull is forcefully foam filled, leaving no space for water if the hull is penetrated. This foam fill makes the boat notably quiet over the water. Inside, Evolution has made sure your toes go under the sides all the way around. The bimini is mounted high enough to stand up underneath and the helm seat is on a slide so it can be quickly shoved back to stand at the wheel. The set-up of anchor well, fairlead and low rail is spot-on. Stowage space below the foredeck is accessible either from the helm area or through access ports in the walkthrough. A hatch between the seats opens to a below-decks icebox, plus a central hatch aft lifts to reveal a fish box; a nice surprise. Standard features include an upholstered pad across the aft bulkhead, lockers in the bulkhead itself and bait wells each side of the covering board and workbench. The level of finish throughout is exceptional and small details aren’t forgotten—a good indication of how well this boat is built. Five-metre boats don’t get any better than this. If you option carpet on the deck, the Evolution 500 gets full marks. 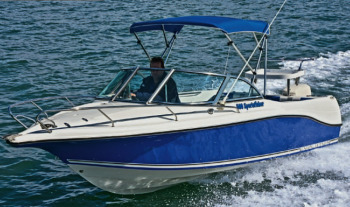 The test boat was powered by a 90hp Evinrude E-Tec fitted with an Evinrude Viper 15in-pitch propeller.